I also live in Scotland (in the central belt) and have 3 bengal boys and my recent addition Nova. Nova is of show standard and is also on the active register (although I have not made a final decision on breeding her yet). Nova comes from a silver sire so will be TICA registered and I also plan to join the show circuit this year. Do you have any pics? There is some recent photos of Nova and older ones of the bengal boys (Lubo, Lenny and Loki) in the gallery. She is my baby lol dont know where id be without her!! welcome to the bengal forum , as donna said here are all the bengal nutters! 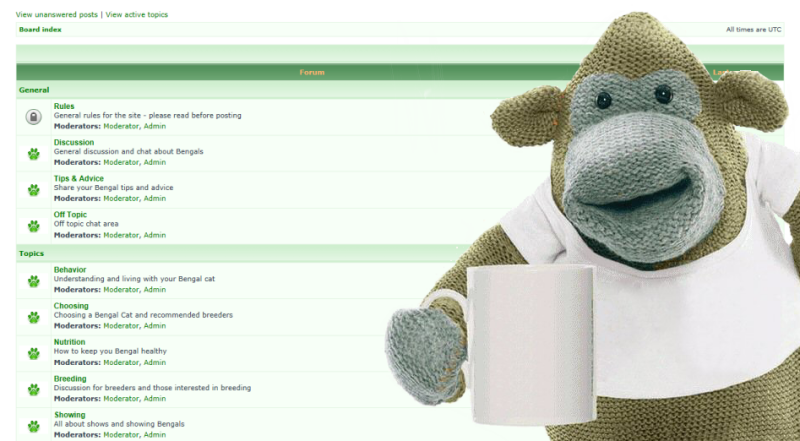 great chatting to you over on the potty pet forum as well! Thanks Linda aswell she is a cutie only a week till i get new one girl very much looking forward to it!! Oh no.....a potty pets forum? Sounds dangerous Is it the pets or their owners that are potty?! Thanks everyone, look forward to chatting to you all aswell, lovely wildside website! !